The Yale Bulldogs head to Kohl Center to take on the Wisconsin Badgers on Sunday, November 12, 2017. Yale heads into this matchup after finishing last year with a mark of 17-10. They had a point differential of 4.2 as they averaged 74.2 points per contest while giving up 69.9 per game. Wisconsin had an overall record of 23-8 last season. They averaged 71.9 points per game and surrendered 61.4, good for a point differential of 10.5. Miye Oni averaged 12.9 points per contest in 31.2 minutes per game last year. He averaged 2.7 assists per game and 6.3 rebounds per contest. His field goal percentage was 44% for the season while his free throw percentage was 78%. Alex Copeland averaged 12.9 points per contest while playing 25 minutes per night last year. He grabbed 1.8 rebounds per contest and distributed 2 assists per game. His FG percentage was 42% while his free throw percentage was 80%. Ethan Happ averaged 14 points per game last year and he saw the court an average of 27.9 minutes per game. He also hauled in 9 rebounds per game and dished 2.8 assists per contest. His field goal percentage was 59% and his free throw percentage was 50%. Bronson Koenig scored 14.5 points per contest while playing 31.4 minutes per game last season. He hauled in 2.1 rebounds per contest and had 2 assists per game on the season. His FG percentage was 42% and his free throw percentage was at 91%. The Bulldogs allowed 69.9 points per contest which was 117th in Division 1. They also surrendered a 43% shooting percentage and a 33% average from 3-point range, ranking them 133rd and 70th in defensive field goal percentage. Opponents averaged 33.1 rebounds a game which ranked 69th, and they allowed 13.3 assists per game which put them in 181st place in the country. They forced 11.8 turnovers per game which ranked them 69th in the nation. Yale averaged 74.2 points per contest last year, which was 156th in D-1. Their average scoring margin was 4.2 and their shooting percentage was 47% as a unit, which had them ranked 61st. From 3-point territory they shot 36%, which was good for 146th in college basketball. They averaged 36.4 boards per contest and 15.6 assists per game, which ranked them 138th and 55th in those offensive categories. In the turnover department they were 190th with 13.0 per game. The Badgers gave up 61.4 points per game, which ranked them 9th in the country. Their defense surrendered a 41% shooting percentage and a 38% average from behind the 3-point line, ranking them 41st and 311th in those defensive statistics. They ranked 9th with 10.2 dimes allowed per game and 14th with 31.0 boards surrendered per contest. The Badgers were 163rd in the nation in forcing turnovers with 13.0 per contest last year. 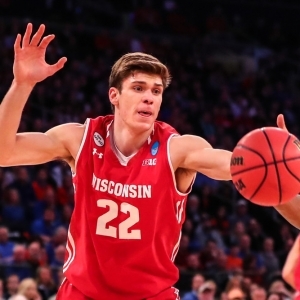 Wisconsin was 204th in Division 1 with 71.9 points per contest last season. They were 133rd in the country in shooting at 45%, while their average scoring margin was 10.5. They shot 36% from beyond the arc, which was good for 154th in D-1. They were 95th in college basketball in rebounding with 37.3 boards per contest and 164th in assists per game with 13.6. The Badgers were 328th in turnovers per contest with 11.0. The Bulldogs were 95th in the nation last year in offensive rating with 108.2, and their defensive rating of 102 was ranked 166th. In terms of pace they were 249th in the country with 68.3 possessions per 40 minutes, and their effective field goal percentage of 53% was 80th. As a team they were 72nd in college basketball in true shooting percentage with 56% and they shot 3-pointers on 35% of their shots, ranking 204th in Division 1. Yale was 148th in turnovers, as they turned the ball over an average of 16.6 times per 100 possessions while forcing 15 on the defensive end. Their defensive effective field goal percentage for the season was 49%, which was 129th in the nation. Wisconsin was 318th in college basketball in turnovers, as they turned the ball over an average of 14.2 times per 100 possessions while forcing 17.8 on the defensive end. Their defensive effective field goal percentage for the season was 47%, which was 53rd in the nation. The Badgers were 58th in the country in offensive rating with 110.2, and their defensive rating of 94.1 was ranked 19th. In terms of pace they were 341st in Division 1 with 64.5 possessions per 40 minutes, and their effective field goal percentage of 52% was 130th. As a team they were 197th in D-1 in true shooting percentage with 54% and they shot 3-pointers on 37% of their shots, ranking 166th in the nation.